Back in November of last year, I was interviewed by the St Helens Chamber for a Digital Marketing article in their Comment Magazine which was published last week on page 8. Digital Marketing is a huge topic which I could talk about all day, however the Comment Magazine article had a limit of around 800 words, so I thought I’d write this blog post to expand on some of the points I was quoted on and talk about others which didn’t make the final piece. Hopefully this will further enhance what actionable information you get out of it. Digital Marketing is more important than ever and not just for big business’s either. If you own a small business and don’t have a digital strategy in place, I’ll guarantee one of your competitors will and it’s them who will have the advantage in your marketplace. Take this little statistic from the article in Comment Magazine. It’s a recent report from FleishmanHillard they found that 89% of consumers use a search engine to find information on products or services before buying. That’s how important a digital marketing strategy will be for your business in 2015. Now I know you might be thinking, we need all of these, however, I would advise picking one and running with that first. Then move onto the others, one by one. Ok, so let’s get started…. 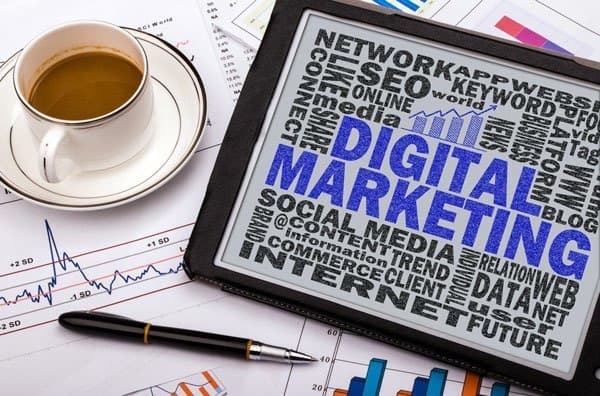 A digital marketing strategy is about much more than just your website, however, your website is core to your business’s online presence and is where most of your digital marketing efforts will be pointing back too. Think of it as your online shop window. So, before you embark on any type of digital marketing strategy make sure you have some basic fundamentals sorted on your website. a) Site speed. I mentioned this in my interview. Your site load time needs to be as fast as possible. Check the load time using a tool like Pingdom’s or GTMetrix. Your web pages need to load in less than 3 seconds. Any longer and you risk them bouncing back to the Google search results and going to one of your competitors. Nobody likes a slow website! b) Navigation. Make sure your website is easy to navigate. Simple top or sidebar bar menus and internal links to related pages are a good place to start. TIP: Internal links also help with on page SEO, sites like Wikipedia do any excellent job of this. c) Have clear Call To Actions that stand out. Tell people they should do next, whether that’s fill in a form, call your telephone number, download a brochure etc. Don’t assume they know what you want them to do. d) Clear Benefits. Make sure the benefits of your product or service are clearly highlighted on your website. There’s an old copywriting saying that been around for decades and it’s still true to this day…”Features tell, benefits sell”. e) Title & Description Tags. Create unique, click enticing Meta Title and Description tags on all web pages. These are what you see in the Google search results and well written titles and descriptions can results in you getting more clicks than websites above you in the search engines. Getting more clicks will also improve your CTR (Click Through Rate) in the organic search results. CTR is one of the 200+ ranking factors that Google use in their algorithm and has become more important over the past year. These Meta Tags are also important for on-page SEO. f) Create a Search Console Account. This Google tool contains information they already have on your website and this data can really help with sorting any issues out like 404 errors, security, indexing problems etc. You’ve probably been subject to retargeting ads without even knowing it. Retargeting (or remarketing as Google currently call it), allows you to retarget prospects who have been on your website and left with specific targeted ads. This is an extremely powerful, cost effective way of remarketing your products/services to visitors who have left your website without taking a specific action. A user lands on your website, has a look around and then leaves without making a purchase or completing an enquiry form. A cookie is then dropped on their pc which then allows relevant ads that you control to be displayed to them as they surf around the internet. This allows you to build lists of people who have shown an interest in your website which you can then use again and again. Depending on the platform used, you will also get demographic data like Age and Gender for example so you can further tweak and make your campaigns more targeted. Offer a specific promotion to users who bounced from your website. These are people who didn’t fill in your contact form, download a brochure/white paper or complete their purchase. This offer would only be available and seen by those users. If someone has made the effort to visit your site then keeping your brand at the top of their mind whilst they’re doing their research can have a huge influence on them revisiting and checking your website out again. Maybe the product or service the visitor checked out wasn’t quite right for them and they didn’t see what else you have to offer. You can use retargeting ads to market these other products/services to them. Communication with your prospects doesn’t stop when they leave your website. Use retargeting ads to further continue the conversation and speak to them differently using different marketing messages than your original one. According to a recent Forester report 96% of visitors leave a website without completing a transaction or other desired action. That’s a lot of potential customers leaving your website. Retargeting helps you nurture the relationship with these visitors to hopefully bring them back in the fold and purchase your product or engage and make a call. Traffic from mobile devices has been increasing year on year since smartphone where first released and this accelerated even more with the boom in tablet sales. On average, clients of Expose Profits are currently seeing between 30-40% of visits coming from a mobile device with some as high as 60%. As you can see with numbers like these, if your website isn’t optimised for mobile then you could be missing out on a lot of potential customers. In my opinion (and Google’s) a responsive web design is the way to go. A responsive web design is one that ‘responds’ to the device its being viewed on and changes its layout and design based on that. Take exposeprofits.com as an example, if you view it on a desktop it will look different than when viewed on your smartphone. This makes it easier for the visitor the read content, click on links and more importantly fill in vital lead information without having to pinch and expand all the time. If users are forced to pinch and expand to read and navigate your website it won’t be long before they get frustrated and go looking elsewhere, therefore leaving you with a lost opportunity. You need to make your website is as easy as possible to read and navigate if you want potential customers to take action and purchase a product or engage with you about the service they’re interested in. Peoples browsing habits have also changed. At the start of their buying cycle, they might be at work, or out and about and start off browsing the internet on their mobile to find out which company they want to do business with. Then once they’re home, they change to their desktop or laptop to continue their research on their shortlist of potential businesses. If you don’t have a mobile friendly website then there’s a high chance you won’t make that shortlist. One more important point is Google are also introducing a mobile friendly tag in their mobile search results. This will indicate to people in Google’s search results whether a website is mobile friendly or not. So if yours isn’t, then potential customers may well click on your competitor’s website which is mobile friendly. Email Marketing is an age old form of digital marketing was mentioned in the Comment article and according to econsultancy.com is still the best digital channel for producing a positive ROI. Picture this scenario, you are about to launch a new product/service or a special offer and you want to let your current client base know about it. What other form of marketing is cheaper than crafting a powerful email highlighting the main benefits to the customer and then having strong Call to Action within it, telling them to find out more about your ground breaking service/offer on your website. Compare that to a Direct mail campaign to all your customers! If you’ve not got a current email service provider, then give mailchimp.com a try. They have a free offering where you can email up to 2000 subscribers, and send 10,000 emails a month, which is a great way to get you started. First I’ll start with a quick explanation of what a conversion rate is. A conversion is whatever action you want someone to take on a web page, so If you get 100 visitors to a contact us page and 10 of those fill in their details and contact you. Your contact form will have a conversion rate of 10% because 10% of the visitors have filled form in. Conversion Optimisation is a structured, systematic approach to improving the overall performance of your website and in my opinion, is without doubt the only controlled, measurable way you can increase the amount of leads/sales your website generates. If you increase the amount of conversions you are getting more leads/sales for your business without having to invest money into getting more traffic. That’s pretty powerful wouldn’t you agree? So first you need to define what a conversion is which could be; visitors filling in your contact us form, entering their email to download a report, clicking on a particular button etc. On your website you will probably have (or should have) a contact us form. This form might have a box where the visitor can enter their telephone number and when someone enters their details they are sent to a ‘thanks for contacting us’ page or something similar. (NOTE- if you’re not tracking contact form submissions, you should be). So in this instance, as a basic test, we would create an alternate contact us page that doesn’t have that telephone number field and then track the results. Traffic is then sent to each of these pages alternately and after around 70-100 visits to those pages, you will be able to see which version of the form has got most leads for your business. My guess is that it will be the version without the telephone number. We would then change that on the actual live form and then test another element. This could be button text, colours, words used etc. Over time you will see the conversion rate increase and the amount of leads your website produces go up and who doesn’t want that right? Video Marketing is an area which Expose Profits will be putting more focus on in 2015 and beyond. Get ready to see a lot more videos around the internet with my ugly mug on! With larger screens and the introduction of 4G, online video is growing at an exponential rate. 72% of consumers watch video on their mobile phones and did you know that Youtube is the second biggest search engine behind Google (who own Youtube). Whether it’s an explainer video like one we did for a client Gleam Team or an animated video like we have here, it’s highly advisable that use video in your business to help increase engagement and visibility online. We’ve already discussed tracking submissions on your contact form, but what about incoming sales calls? Imagine being able to see which keywords in your Adwords campaigns, or which marketing channel has resulted in a sales call. Call Tracking allows you to do exactly that. Big businesses have been tracking their calls for years and now the technology is available to those on a more conservative budget. If you visit our website on 2 different devices, you will notice that you’ll see a different phone number each time. This is because we use a pool of numbers which allows us to see exactly which one of our marketing campaigns has generated that call. This is extremely useful as it allows you to accurately calculate your ROI (Return On Investment) from a particular campaign. Too many businesses do what I call ‘Spray & Pray’. They don’t know where their calls are coming from and therefore ending up continually wasting money on marketing campaigns that are just not working. So hopefully, this article has helped explain some of the digital marketing strategies you should be looking at for your business in 2015 and at the very least you should prioritise sorting your website out and give retargeting/remarketing a try. 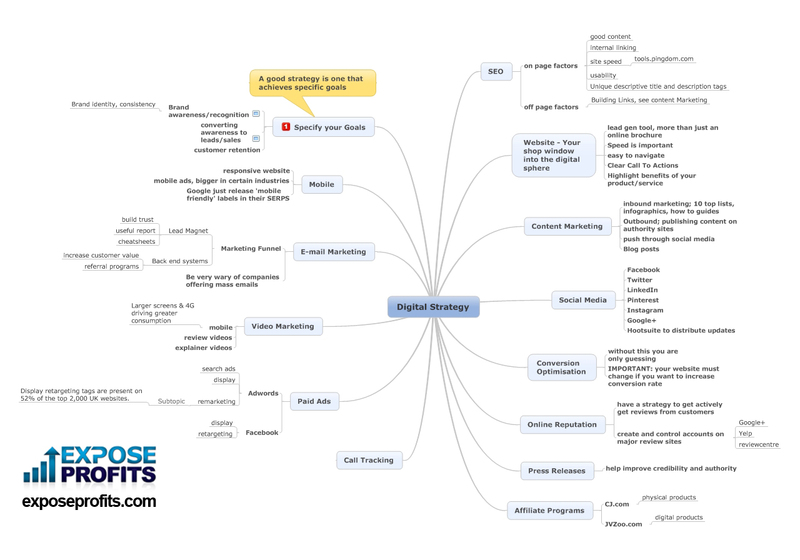 Before I wrap up, I’ve created a mindmap to help you visualise the variety of different digital marketing strategies available for your business. If you have any questions or would like us to help you create a Digital Marketing Strategy for your business and start implementing some of the strategies mentioned then give me a call on 0161 885 5103 and I’d be more than happy to help. I wish you and your business all the success in 2015 and beyond.